I have all these apps and I found this one was the easiest to navigate! Always love the sobriety calculator. Easy to use, if you are in a book study and forgot your book, its all there on the phone. Sobriety counter changes your sobriety date by mistake when you change time zones. That would be my only complaint. I use the App daily and love it. It would be extremely helpful if the table of contents listed at the minimum the starting page numbers of each chapter. The alternative is to guess which chapter I think has a specific page and go in and out of eChchapter until I find the chapter which contains the page I’m looking for. It is frustrating to have to go through this process all the time. I have gone back to my paper B.B. frequently instead of using the app. Update for iPhone X? Edit: Updated! App is nicely laid out and organized. Like the note feature but is there a way to sync between ipad and iphone? Please add page numbers which correspond to page numbers in Big Book so we can keep up with Big Book study’s in meetings. It wouldn’t me necessary to keep them is the same order as the book as long as we could search text by page numbers . Thanks ;in advance. I only use this app with my Big Book! Great search feature. One thing though since it's a one day at a time program, maybe consider listing number of days sober first in the opening splash screen instead of years. But I do understand the progression from years to hours. Keep up the good work. Purchased this app after using it on android over the years. It works the same, but could you update the aspect ratio to work with the iPhone X? Love the app, but would love Dr. Paul’s story from the third edition (page 449). He talks about acceptance. Would love to read that daily on the app. Thank you for your service! It was a great Pleasure to find this manual. Dean has put a lot of effort to make the corrections so now everything just works, Great job! I hope he gives us color choices for highlighting. I recommend this app to all in recovery. Sobriety calculator is not working!!!! Fix it... You charging for a book you didn't write. Dean you are breaking our traditions. Make it free. Stop making money off AA!!!!! I find it very handy on my subway rides to catch up on my reading. Most accurate big book app. This is a very well put together and useful app. But if I'm not mistaken this is only the 2nd addition of the big book. The current version being give out in AA meetings is the 4th addition. I would love to keep using this app but I hate having to refer back to my actual big book to make sure I am getting the most up to date text. I would definitely give this a 5 star review if the Dev were to update the text. Also a bookmarking feature would be nice so I could bookmark multiple pages for study purpose. Hopefully whoever gets this app has already read the book. If you are familiar with the Big Book then this is a great tool to refer back to. It has search available, the ability to highlight, and the ability to make notes. The extra 12 step prayers is a nice addition. I also like that the opening screen is a sobriety calculator. It's a nice reminder that this thing works. I have been using this app daily for the past few weeks. I am not an alcoholic, but a food addict. The ability to simply pull out your phone and have The Big Book available!! To be able to hi-light portions, search, journal, find meetings.....just amazing. Thank You Higher Power for giving the developer such skill and knowledge to help us all. 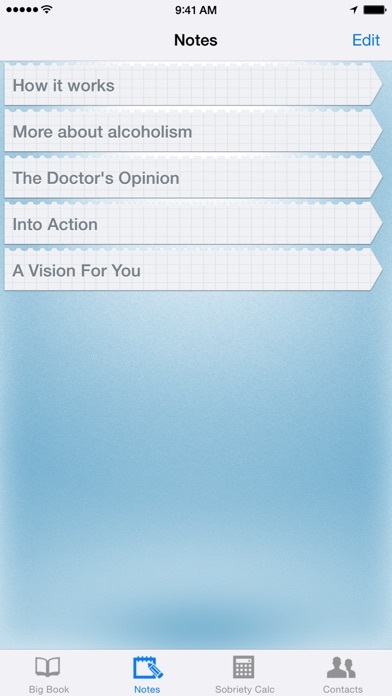 "Together We Get Better"
Great app. Good searching. 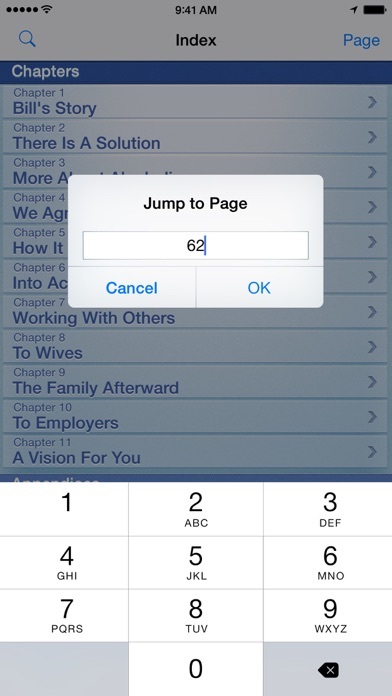 Jump to page. Includes all 164 pages and some stories. But not current. Needs to be updated to 4th edition. Also need to be able to jump to pages including the stories like pg 417 for acceptance once updated to 4th Ed. Notes are gear too. Please change sobriety counter to do years months and days instead of 4.33 years Do 4 years 4 months 12 days. Would recommend to all recovering AA. This app is great. Comes in handy but after the recent update I notice it no longer saves my info like bookmarks or sobriety date. It's a lil annoying each time I open it up and have to keep putting in the info over and over. I'll try uninstalling and download again. Keep up the good work. Thank you for your service. Acceptance was the key! Big missing piece here! Was pg 449 (3rd ed. ), pg 417 (4th ed. ), use this & read almost everyday, so I have to leave this app and go elsewhere, finding myself using less & less. This app is solid. The notes and highlight options are great! My only complaint is that the italicized words in the book are not present in the app. Please make this identical to the text! Italics! Search feature is great but result remains highlighted. Unable to un-highlight it. This is a beautiful piece of work and an essential app for anybody who's made the decision to live the steps. The search engine ensures you'll never be at a loss for the reference you need in the moment. Fantastic app but, why no Twelve and Twelve? when i first open the app it says to enter sobriety date but when you touch the screen it jumps to the big book and that is it. you can read and search the book but nothing else. none of the other features it claims to have are available. a waste of my money. do not download! Just downloaded this. Works in landscape, has search/index capacity; Like the way it shows the search results in relation to one another and the sections/divisions of the bb as well. yippee! Love the app. I especially like the notes (bookmarks) feature. It would be nice if there was a way to adjust the order of notes or at least auto-sort according to book location. Different highlight colors would also be cool. Thanks! Daily reflections would be a great addition . Meeting schedule could be better. All in all ok app. If I didn't pick things apart would I be alcoholic. Dictionary feature is awesome. Missing one of my favorite stories. Still my most used program resource! I'd gladly give this 5 stars if it had the 4th edition stories added. It's an invaluable tool for recovery. The best recovery app on the App Store! I'm so grateful for finding this app! Hands down the best and easiest to use! The 12 steps, 12 traditions, prayers and personal stories are nice to have on the go! Today I celebrate 4 years sober and this app has been with me since Day 1! What a gift. Still Sober! Must have app for the recovering addict. Great app. Provides the12-step practitioner with all they need. Buy now and but on your home page. It's a no brainer! Great up but please update to the 4th edition. This is the 3rd edition of the big book and does not include current stories. It is March 22nd, 2015. Time for an update from the dev. I did the latest update and it's working fine now. Great app. WELCOME BACK! I wrote my first two personal notes on my journey to sobriety and it didn't save them. Great app. Big book search works great! Why is this app missing the most famous chapter in the book? Doesn't include forwards to 3rd or 4th edition. Doesn't seem to respond correctly when selecting "Preface." Love it! It makes staying sober fun! I gotta say, this is one of the most practical apps ever! I can anonymously, read the big book, virtually anywhere! The prayer tabs make it easier for me to stay connected spiritually. I can easily do my morning prayers, 3rd, 7th to get started right. Eve prayers, and 11th step for night. I've also used it to reconnect during the day. Great user experience! Thank you! Thank you. Thank you! -27.77 yrs sober. Deceiving Cover Page - Falsely Presented! I thought I was purchasing the AA 12 X 12 book. What I received was the Big Book with the short versions of the Steps & Traditions. You shouldn't use the 12 X 12s cover when I only received the short versions. I already have a FREE version of the Big Book which includes the same as your plus much more. I feel ripped off! Doesn't have stories from the third and fourth editions. Most groups are now using the 4th edition which has many stories that are not in this app. The app should update to current edition and make stories page retrievable. Overall a good tool for people in the program, but to omit "Doctor, Addict, Alcoholic(Acceptance)" from the personal stories?! Who edited this? Leaving out one of, if not the most quoted , best personal stories ever included in any of the editions ...?! What happened to page 417/449 acceptance dr addict alcoholic? Loved this ap, the ability to search by page number and finding what was needed almost instantly seems just in October it worked. Today couldn't find acceptance by Paul O please restore and restore search by page so I am not forced to find another alternative from yours that works so well with this new exception. Why are the personal stories not in order? Why are some missing? Where is pg 417 on acceptance? 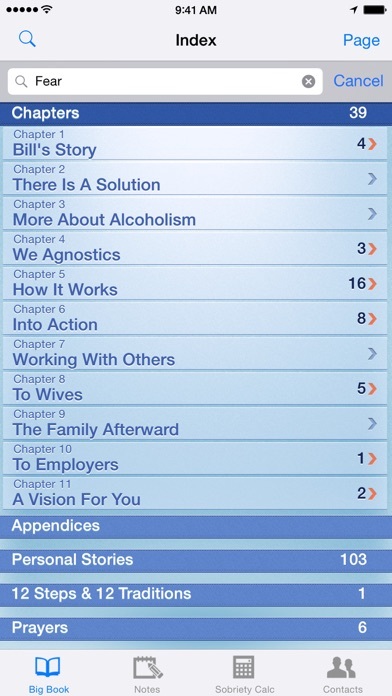 My days sober is ahead by one day some how, also they could make the pages on the app match the pages in the big book. That is all. This is a fantastic tool with lots of handy "extras"! Being a good alcoholic, would like to request a couple more! Lol Can you please add the Preface to the 3rd & 4th editions, can you maybe offer different highlight colors to choose from as well & can we add our notes "within" the text (specifically, word definitions as we're reading the text)? Thank you! Job well done! I have this app on BOTH my iPad and my iPhone for one fee. I use the search feature on key words all the time. I have the fourth edition in a leather cover (the cover is 23 years old) that I carry to every meeting along with a device with this app. I have used the CONTACTS function as I travel to both call other central offices and to directly connect to their web pages to find out of town meetings. Also the app is updated regularly both for IOS changes and changes to contact info. I recommend this app to all my young friends. I love this app. It has everything including prayers for the morning and at night! There are a plethora of 12-step apps available on the App Store, many of which contain the first few chapters of the big book in full, but this one has a few distinguishing features that make it worth paying for, in my opinion. First of all, you can annotate the text in this app, including highlighting and adding notes by section. This also contains the personal stories from, if I'm not mistaken, all four editions of the big book to date. My only complaint as of now is that there is no night-reading option (i.e. white text on a black background), but that's certainly not a deal-breaker. I love being able to highlight and reference back easily to messages that resonated with me! 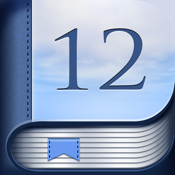 The app photo shows content from the 12&12 but it's only the big book. I already had a big book app and it was free. Wish I could get my money back. Love having the Big Book on my phone but the sobriety counter is always off. Every month has read a day early and now my 1 year shows me celebrating 2 days early. Would be nice to have it accurate so I can share with family and friends. Sobriety tracking function? Not working on my iPad. Says to enter date but doesn't give you way to do it. No text box, keyboard doesn't come.up. Click screen, opens up contents but not way to enter date. Any advice? The date tracker through me off at first too. Open the app and tap the screen. On the "reading page", tap 'calculator' in the top right corner. This opens the Sobriety Date Tracker and allows you to enter your date, or correct your date if it's wrong. Keeping it simple. Would have been great if it had all the chapters... I know for sure it's missing the chapter "my chance to live"
Good except it does not save sobriety date. I installed this app on an earlier iPhone. Now having installed it on my iPhone 6, it no longer saves the sobriety date. It worked fine on earlier version. The only thing that would make it perfect, and a five star app, would be updating the Big Book to the current fourth edition. One of the MOST QUOTED STORIES in a meeting, Acceptance Was the Answer ( Dr. Addict Alcoholic) is not included in the personal stories. Perhaps you could do an app update to include it. I carry my iPad to meetings and rely on it for my Big Book. Also, when will the 12x12 be one of your apps? Since writing that review, your app will not allow text resizing on my phone or iPad. It has now become useless. THE BEST APP I OWN. This app is spiritually and aesthetically pleasing. It was important to me that the sobriety counter counted in days; it also includes years, months or hours if you prefer. There's not a disappointing thing about this lovely app. Do yourself a favor: buy it. Worth every one of those 299 pennies! Keep the Faith, Stay the Path. I'm so grateful for finding this app! Hands down the best and easiest to use! The 12 steps, 12 traditions, prayers and personal stories are a nice bonus to have on the go too! I'm so grateful for finding this app! Hands down the best and easiest to use! The 12 steps, 12 traditions, prayers and personal stories are nice bonus to have on the go too! Well-thought design with sobriety calculator and quick, easy, access to the every day Big Book components you’ll need for meeting readings, shares, prayers and more. You can quickly access topics like The Promises, so you’re expertly ‘on topic’ if you don’t have passages memorized. I also love the ability to zoom from the screen. 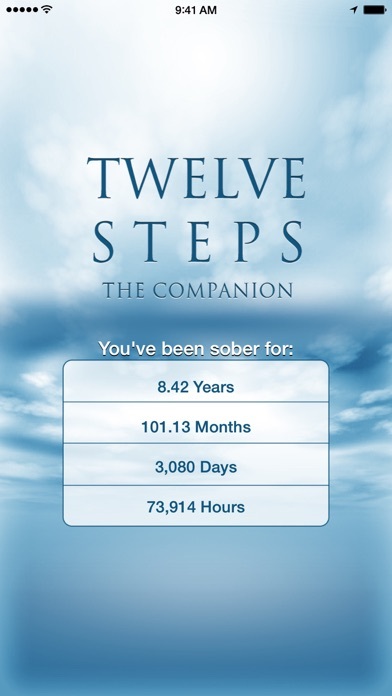 I highly recommend this app for your sobriety toolbox! NOT the 12 and 12 Book - Buyer Beware! Don’t be deceived! This is NOT the 12 and 12 Book, which I thought it was. Don’t mindlessly blow $2.99 thinking it is. This App has been a favorite of mine for over 10 years. This beautiful software was nonfunctional in iOS 12. IOS 12.1 fixed it. Thanks. This App has been a favorite of mine for over 10 years. Three weeks ago I wrote to the developer by email. I never heard back from him. I am certain that he knows that this beautiful software is completely nonfunctional in iOS 12. My suggestion is, do not purchase now, until you know that there is an update to the software more recent than 7 months ago.